This is the simplest yet one of the most satisfying side dishes you can accompany a hearty meat. 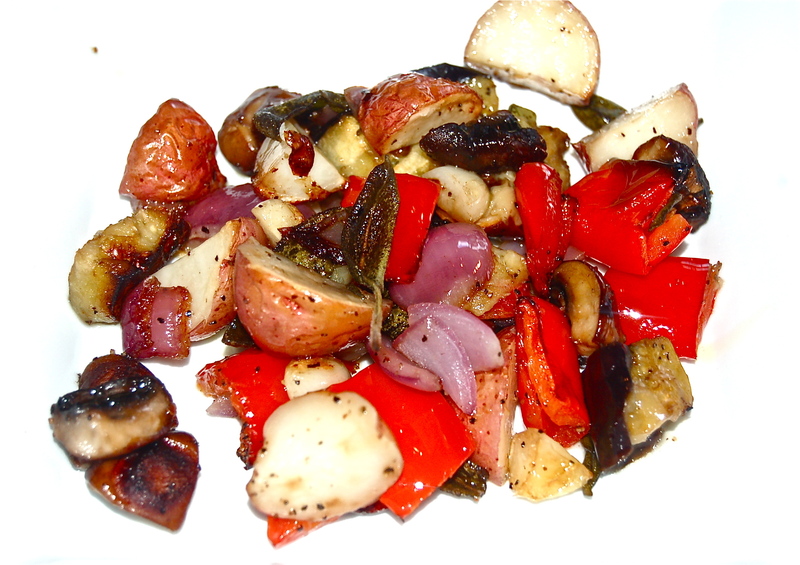 All it is, is a melange of tasty vegetables roasted brown & caramelized. It plates beautifully & tastes wonderfully. The recipe came from our dear friend Louise Chinn. We return to it constantly. 1. Heat the oven to 450F. 1. Cut all the vegetables into a 1-1/2″ dice. 2. Add to a mixing bowl along with the Sage leaves. 3. Add the Olive Oil & gently combine it all. 4. Move them to a baking sheet & roast for about 30 minutes. 5. When tender, browned & caramelized remove & prepare to plate.